We are committed to provide quality and innovative urban living solutions in Asia. as compared to $1.8b for FY 2015.
as compared to $661m for FY 2015. Sold about 5,720 homes in Asia, mostly in China and Vietnam, 25% more than the total number of units sold in 2015. Divested about $680 million worth of assets including an office building in Sydney, a retail mall in Shanghai, two townships in Chengdu and Wuxi, and a hotel in Mandalay. Invested about $460 million to strengthen portfolio across China, Vietnam, Indonesia, and Myanmar. Invest strategically and opportunistically in developed and emerging markets, as well as in new and existing platforms, projects and properties. Tap demand in China and Vietnam with over 13,000 launch‑ready homes over the next few years. Actively scale up commercial presence and leverage retail management capability to strengthen portfolio of retail and integrated developments. Monetise assets strategically to recycle capital and achieve higher returns. The Property Division generated $2.0 billion in revenue, an increase of $212 million or 12% from $1.8 billion in FY 2015. This was mainly due to increased revenue from its residential projects, The Glades and Highline Residences in Singapore, as well as 8 Park Avenue in Shanghai, China. Pre‑tax profit decreased $89 million or 11% to $759 million in FY 2016, due to lower fair value gains on investment properties. With the completion of Keppel Land’s Selective Capital Reduction exercise in 2016, we now have full ownership of the Group’s Property Division. With a net profit of $620 million for FY 2016, the Property Division was the top contributor to Group earnings at 79% of total net profit. Singapore’s economy grew by 1.8% in 2016, as slower global economic growth and geopolitical risks impacted manufacturing, trade and financial services. Property cooling measures continued to weigh on the Singapore residential market. Conditions were further exacerbated by global uncertainties and rising interest rates. Despite a 7.2% increase in the total number of new homes sold in 2016 to 7,972 units, private residential prices continued to fall by 3.1% in 2016. According to CB Richard Ellis (CBRE), Grade A Central Business District (CBD) office rents dropped by 12.5% year‑on‑year in 4Q 2016. Office rents in the CBD are expected to continue to face downward pressure from new supply coming on stream and the global economic slowdown. In China, Gross Domestic Product (GDP) growth was the lowest since 1990 at 6.7% in 2016, compared with 6.9% in 2015. Services accounted for 58.2% of the GDP growth, mainly due to an increase in e‑commerce and online retail sales. China’s property market was active with an increase of 22.4% and 36.1% in residential sales volume and value respectively, in 2016. In Vietnam, GDP growth was 6.2% in 2016, bolstered by strong Foreign Direct Investments and growth in manufacturing and exports. According to CBRE, approximately 35,000 out of 37,400 launched apartments were sold in Ho Chi Minh City, with average prices increasing by 4.6% in 2016. There was no new Grade A office supply in 2016. Meanwhile, Keppel Land’s Saigon Centre Phase 2 retail mall in the CBD and four other projects in the non‑CBD areas added more than 192,000 square metres (sm) of retail space in 2016. Keppel Land completed two major developments in 2016. Corals at Keppel Bay is a 366‑unit condominium, designed by world‑renowned master architect Daniel Libeskind, offering a luxurious waterfront living experience. The other project is The Glades, a 726‑unit condominium, located near the Tanah Merah MRT station. The Glades is Keppel Land’s first joint venture (JV) project with China Vanke in Singapore. Despite property cooling measures weighing on the market, Keppel Land’s Singapore properties performed creditably during the year. We sold a total of 380 residential units in Singapore in 2016, compared with 190 units in 2015, as a result of improved market sentiments. 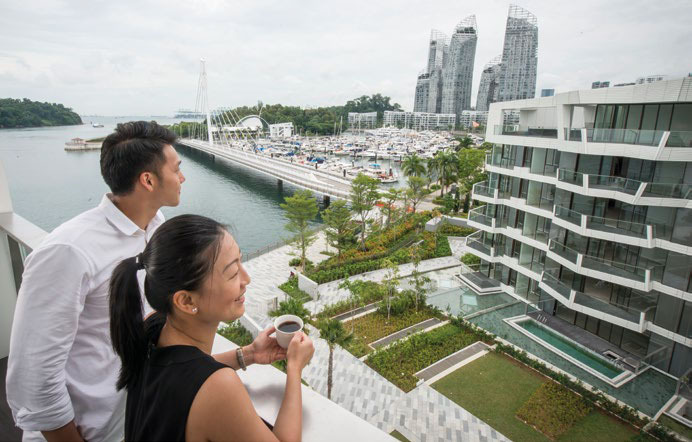 In addition, the completion of The Glades and Corals at Keppel Bay allowed potential buyers to view the finished apartments and move in soon after. During the year, Keppel Land’s Singapore residential properties, such as Corals at Keppel Bay, performed well. During the year, Keppel Land’s properties in China continued to draw home buyers, despite the implementation of property cooling measures in various Tier‑1 and Tier‑2 cities. Amidst increasing urbanisation and rising affluence in the Chinese population, Keppel Land sold a total of 3,800 homes in 2016, 16% higher than the 3,280 units sold in 2015. This was primarily due to the strong take‑up of Keppel Land’s homes in the Sino‑Singapore Tianjin Eco‑City, V City and Park Avenue Heights in Chengdu, Seasons Residence in Shanghai, as well as Central Park City township in Wuxi. In Vietnam, Keppel Land’s residential projects continued to deliver stellar performance. We achieved a sales record for the second consecutive year with 1,520 units sold in 2016, over 60% higher than the 930 units sold in 2015. Riding on positive home‑buyer sentiments in the country, Keppel Land launched four residential projects namely Palm Residence, Palm Heights, The View (Riviera Point Phase 1B) and Linden Residences (Empire City Phase 1), in Ho Chi Minh City. All four launches achieved high take‑up rates, particularly Palm Residences, which saw all 135 launched units selling out over one weekend. Keppel Land also boosted its commercial presence in Vietnam during the year. The Saigon Centre Phase 2 retail mall opened in August 2016 and has since become the preferred shopping destination for international brands, placing it at the forefront of Ho Chi Minh City’s retail sector. Opening Saigon Centre retail mall and Takashimaya Department Store in a symbolic ceremony are Mr Ang Wee Gee (third from left), CEO of Keppel Land, and Mr Shigeru Kimoto (third from right), President of Takashimaya. The ceremony was witnessed by H.E. 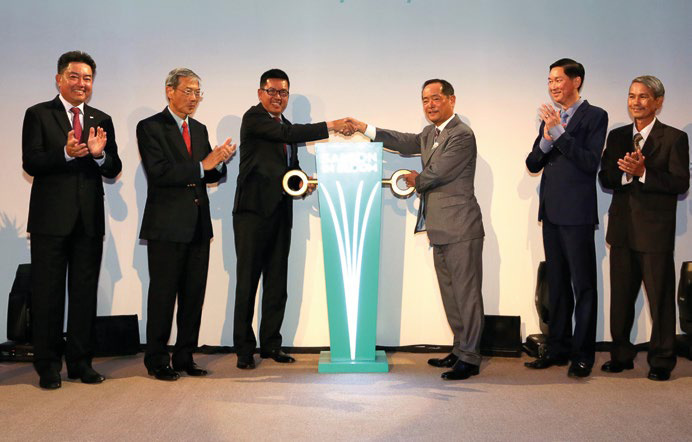 Mr Tran Vinh Tuyen (second from right), Vice Chairman of the People’s Committee of Ho Chi Minh City, and Dr Lee Boon Yang (second from left), Chairman of Keppel Corporation. In Myanmar, Keppel Land achieved significant milestones in its projects. We topped off Junction City Tower, which offers a net leasable area of about 33,400 sm of premium Grade A office space, and also opened Sedona Hotel Yangon’s Inya Wing. Keppel Land is well‑positioned to meet the rising needs of international businesses and tourism in Myanmar. Our Property Division continued to proactively review and seek opportunities to recycle its assets. Keppel Land announced 11 divestments in 2016. Assets amounting to about $680 million were monetised. In China, these included the sale of the stake in Life Hub @ Jinqiao, a retail mall in Shanghai jointly‑owned by Keppel Land and Alpha Investment Partners (Alpha), a golf club in Jiangyin, and two townships in Chengdu and Wuxi respectively. Divestments in other parts of the world included the sale of stakes in a listed property vehicle in Thailand, a condominium project in Sri Lanka, a serviced apartment and an office building in Hanoi, Vietnam and a hotel in Mandalay, Myanmar. As part of the Group’s capital recycling strategy, Keppel Land invested about $460 million in 2016, building up its portfolio in China, Vietnam, Indonesia and Myanmar. The company will continue to proactively unlock value from existing assets, while reinvesting its capital to generate the best risk‑adjusted returns for the Group. Keppel Land continued to strengthen its presence in its core markets of Singapore and China, and expand in its growth markets of Vietnam and Indonesia. It also seized opportunities in other emerging markets and global gateway cities. In 2016, Array Real Estate was rebranded as Keppel Land Retail Management. Strengthening its commercial portfolio, Keppel Land acquired a 22.4% stake in I12 Katong, a retail mall in Singapore, and a newly completed retail mall in Jiading, Shanghai. In Myanmar, it further committed to a 40% stake in Junction City Phase 2, a mixed development comprising serviced apartments and offices, following its initial 40% stake investment in Junction City Office Tower in 2015. Enlarging its footprint in Vietnam, Keppel Land invested in several joint ventures in Ho Chi Minh City, including one for Empire City in the Thu Thiem New Urban Area, Ho Chi Minh City’s new CBD. The first phase of Empire City was launched in December 2016 and received positive response. Keppel Land also increased its investment in Nam Long Group, a leading affordable housing developer in Ho Chi Minh City, through the subscription of VND 500 billion (approximately S$30.4 million) convertible bonds due in 2020. In Jakarta, Keppel Land entered into a JV with Metland Group, one of Indonesia’s leading property developers, to develop 450 landed homes in Tangerang. Following the completion of the restructuring of our asset managers under Keppel Capital, Keppel Land divested its stakes in both Alpha and the management company of Keppel REIT. Keppel Land continues to maintain its investments in the various funds of Alpha and holds about 45% of Keppel REIT. Through Alpha’s funds and Keppel REIT, Keppel Land will continue to enjoy investment opportunities in new markets and recurring income, as well as divestment gains from investment properties in Singapore and overseas. Singapore’s economy is not immune to slowing global growth, as well as the impact of increasing insularism and anti‑globalisation sentiments. Its property cooling measures are expected to continue and have a persistent dampening effect on the market. However, selective projects at good locations and with strong value propositions will continue to attract home buyers. With sizeable new office space expected to come on stream in 2017, Grade A office occupancy and rents will continue to moderate. Rapid urbanisation and a burgeoning middle‑class population will continue to drive demand for quality homes and prime commercial space in Asia. Riding on these trends, Keppel Land will tap demand with more than 18,000 overseas launch‑ready homes over the next three years. China is expecting lower GDP growth in 2017 as the government takes steps to avoid an asset bubble and the build‑up of non‑performance loans in the economy. Continuing property cooling measures will curb run‑away prices and keep growth in the property market at a more sustainable level in major cities. Nonetheless, the property market will continue to be supported by rising affluence and demand from the growing urban population. In Vietnam, the government is expected to continue to liberalise international trade, as well as restructure banks and state‑owned enterprises. GDP growth is expected at 6.7% in 2017, underpinned by greater investment spending, wage growth and access to credit which will fuel private consumption. CBRE expects about 44,000 apartments to be launched in 2017, with more focus on the mid‑end and affordable segments. 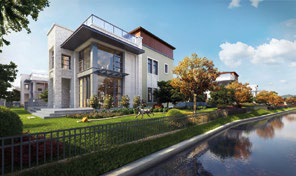 With a sizeable landbank in Vietnam, we plan to launch projects for sale in quick succession over the next few years. In Indonesia, the economy is expected to grow between 5.1% and 5.4% per annum from now to 2020, underpinned by domestic consumption and government infrastructure development. Since August 2015, various economic stimulus packages and tax amnesty have been introduced to strengthen the economy and encourage investments in Indonesia. The residential market remains promising, supported by rising affluence and a growing population of young professionals and families. With a pipeline of about 66,000 residential units and a commercial footprint of over a million square metres of gross floor area under development, Keppel Land is poised to capture opportunities in its target markets.